Chad Allen, the original lead singer of the Guess Who, most notably on their early hit "Shakin' All Over", has been hospitalized in British Columbia after suffering a serious stroke. Allen entered Royal Columbian Hospital in Westminster, BC on August 27. According to the Winnipeg Free Press, Allen, 74, had been in good health so the illness came as a surprise. Family is hopeful for a recovery but it is too early to determine how far the singer can come back. 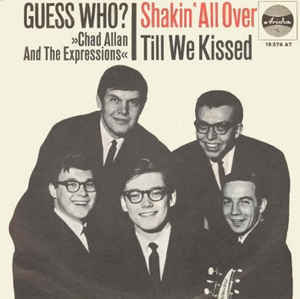 After fronting a couple of local bands, including Chad Allen & the Expressions who released a single of the Johnny Kidd song "Shakin' All Over". As a publicity stunt, the record label released promo singles labeling the band as "Guess Who?" which, by default, became the band's new name. Allen sang on the band's first three albums, Shakin' All Over (1965), Hey Ho (What You Do to Me!) (1965), both under the Chad Allen & the Expressions name, and It's Time (1966), the first as the Guess Who. The band also had a number of Canadian hits during the time including Shakin' All Over (1965 / #22 U.S. / #1 Canada), Tossin' & Turnin' (1965 / #3 Canada), Hey Ho, What You Do to Me (1965 / #3 Canada) and Believe Me (1966 / #10 Canada). When Allen's voice started to become strained, he left the group and returned to college, but, in 1967, he returned to performing as the host of the CBC's Let's Go. Later in his career, in 1971, Allen got back together with Randy Bachman to form Brave Belt; however, he left before they became Bachman-Turner Overdrive.